The summer of 2000 produced two transfer fees that broke and re-broke the world record within the space of a month. Hernán Crespo’s £35.5m move from Parma to Lazio and Luís Figo’s infamous £37m switch from Barcelona to Real Madrid shocked many with the sheer scale of the numbers involved. It was the beginning in earnest of football’s obsession with the big transfer swoop: “Has the world gone mad?” asked the BBC. It certainly seemed that way. Then, against the background of this financial extravagance, a pasty ingénu from the outskirts of Dublin became that year’s most expensive off-season acquisition for a club that didn’t exactly stint when it came to splashing out on the world’s best players. Less than 30 days after Crespo and Figo’s transfers, Internazionale – whose chairman Massimo Moratti had in the late 1990s spent well over £50m on Ronaldo and Christian Vieri – bought Robbie Keane from Coventry City for £13m. The amount paid was chump change in comparison to the record-breaking moves made by Lazio and Real, but the transfer itself was no less remarkable. Inter’s coach Marcello Lippi, the managerial icon who’d won Serie A three times in the 1990s with Juventus, had come to see this relatively unproven, unpretentious Irishman as a player who could help win the Nerazzurri a Scudetto for the first time in over 10 years. Moratti agreed, signed the cheque, and Robbie Keane became the face of Inter’s brave new century. It seemed an unlikely scenario. For calcio zealots of the time, millennium-era Serie A was impossibly exotic, a fantasy world in which media magnates and oil tycoons competed with one another to see whose trinkets were the shiniest. For those on the outside looking in, it was almost unreal, an event taking place on a different planet, and Keane’s arrival at Inter seemed like the conclusion of a wonderful but implausible journey. Keane’s hometown, Tallaght, is a long way from the San Siro. Largely comprised of residential estates, this “sprawling working-class suburb at the foot of the Dublin mountains” is often portrayed as marginalised and uninspiring by crueller elements of the media and wider Irish society. This is unfair, certainly, but it’s not a place that could ever be described as glamorous – not like Milan, anyway. Yet here was this Tallaght kid living it up in one of Europe’s most fashionable cities, sharing a dressing room with gods of the game. For many in Ireland at the time of his transfer, continental footballers were still a breed apart, considered infinitely more cultured and urbane than our own players, despite the rise and fall of a Hibernian golden generation during the preceding years. Italian football culture, in particular, had become mythologised in the early 1990s, and by the middle of the decade, an entire generation of Irish fans had absorbed the cult of Gianluca Vialli, Paolo Maldini and co through Gazzetta Football Italia. For them – or us; or me – Serie A was the Promised Land. But, much like the biblical Promised Land, it had seemed tantalisingly out of reach, something you could only admire from a distance. And yet there was little Robbie Keane scurrying around in the famous blue and black of Internazionale, defying Ireland’s then-limited expectations of its sportsmen. Suddenly, Serie A ceased to be a Cockayne about which to fantasise. It became attainable. In those early days, Keane had about him the air of a gifted ragamuffin. That lank hair and those pallid Irish legs hid a charmingly homespun craftiness, but he was as raw as a player could be. Next to his storied, gloried teammates, he looked out of place, a scampering dilettante mixing it with the intelligentsia. 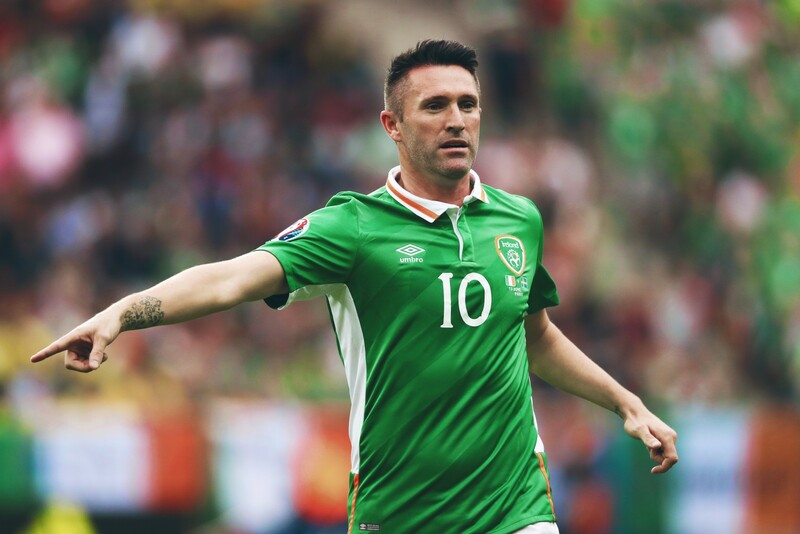 The Inter players even called him “Baby Irish”, and that’s partly what was so endearing about Keane’s time in Milan; the almost clichéd image of a wide-eyed boy wonder trying to make his way in a land totally unlike his own, surrounded by men that must have seen him as a curiosity. After a career in which he’d only ever been considered a wunderkind, worshipped as a child prodigy, Robbie suddenly found himself catapulted out of his comfort zone into a mad world where only the supremely talented were welcome. Here, endeavour wasn’t enough. He’d left a simpler place of Gary McAllisters and Carlton Palmers for one of Clarence Seedorfs and Javier Zanettis; a whole new level of professionalism, expectation and technical proficiency awaited him. And it would be tough. A little too tough, in fact. Initially, Keane was helped by the fact that Lippi liked him – as did Moratti. According to Keane, the Inter president had personally congratulated him after his first appearance for the Milanese – and there were positive murmurs from the Italian press after his debut for Inter. That first match was a Champions League qualifier away to Helsingborg, which Inter lost. Keane had been partnered up front with Hakan Şükür, another recent signing, and the duo failed to gel in the game: “Keane and Şükür are two strikers with very different characteristics and [need] more time to [get to] know each other better,” was the diplomatic but ominous post-match summation of Inter midfielder Benoît Cauet. All things considered, it wasn’t a terrible start for Keane, and it was clear that Lippi genuinely believed in his potential. But not long into the season, Lippi was gone, a victim of Moratti’s impatience. The president demanded results, and if they didn’t come, he wasn’t shy about showing the manager the front door. With Lippi out of the picture, former Italy international Marco Tardelli assumed control of the first team, and his appointment heralded the end of Keane’s spell in Serie A. Under the new head coach, things quickly went downhill for the Irishman. Problematically, neither Lippi nor Tardelli ever really settled on where Keane should play. He was tried as an out-and-out forward, but more commonly as a secondissima punta, feeding off and nipping around a central figure like Şükür or Iván Zamorano: more of a creator than a finisher. Keane failed to excel in this unfamiliar role, something he later put down to his age: “I was probably too young when I went. If I’d gone later it would have suited me playing in that hole,” he said in an interview with Kevin Kilbane in 2014. His play suffered, and the bench beckoned. But it wasn’t just form, positional uncertainty or an unsympathetic manager that led to this: the simple truth was that Keane was the fourth or fifth best striker at the club and, after a time, this had become painfully apparent. Having been dispatched to the fringes of the squad by Tardelli – who was famously reunited with Keane when he became assistant coach of Ireland – it soon became obvious that things weren’t going to work for the youngster in Milan. He began to look for a way out. There was plenty of interest in the Irishman, with as many as eight clubs pursuing his signature. One of them was Leeds United, who had a number of Irish internationals on their books. “Inter offered Keane the choice, and after conceding that there was no future for him in Italy he chose to sign up with David O’Leary’s Elland Road revolution,” wrote Matt Lawton for The Telegraph in December 2000. And that was that. Less than six months after moving to Italy, the adventure was over. Irish hopes of another iconic, Liam Brady-like career in the sun were crushed. A brief modern flirtation with a league outside the Anglo-Saxon remit had ended with a reversion to type. As it was, the unwelcome reality is that Keane ended up just another in a long line of bidoni to have washed up on Italian shores. It could have been more, but it wasn’t. Moratti’s lack of willingness to accept failure meant there was no scope for a bedding-in period: Tardelli, knowing that his boss had few qualms about replacing underlings, simply could not afford to take a chance on Keane. Given time – and it seems strange to write it now – he might have become a respected name in Serie A, but he never truly got the opportunity. The owner’s quest for success waited for no-one. Perhaps Keane just wasn’t good enough to exist in that rarefied atmosphere, or perhaps it was a combination of circumstance and impatience. We’ll never know for certain, but his move to Inter remains one of the most engaging chapters in Irish football lore, albeit a bittersweet one. Irish fans will remember him for his bravery in taking on such a challenge, and for reinforcing the notion that the country’s footballers could be part of a league and a culture outside the tried-and-tested routes, not merely grist to the Premier League mill. Now, in a time when the numbers of top-class Irish players seem to be dwindling, and with Keane’s career edging towards a close, it’s worth recalling this grand episode in a positive light. Here’s to the memory of Robbie Keane in Milan.